So, when George Couros announced, he was trying out an #instagrambookstudy of his book The Innovator’s Mindset, I had to step up to participate. how does curating via Instagram contribute to learning, perspective, community reading? 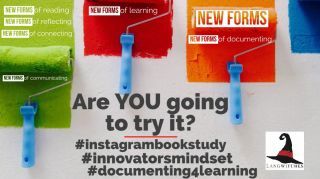 how can I envision using an Instagram book study to support the now literacies? My passion is to bridge the gap of being considered literate in the 20th century to suddenly finding ourselves illiterate in the 21st century and learning how to learn all over to teach and educate children who will live to see the 22nd century! We have to practice what we preach and try new forms of learning to become literate in online spaces and continue to gain fluency. “Learning to recognize and create new and better opportunities for our students is what matters” By @gcouros – It takes practice to know what to look for and RECOGNIZE new forms of opportunities that amplify learning. Being connected to others who are making their “ new and better” opportunities visible helps with the fluency of recognizing. It reminds me how important open and transparent learning is in order to model for our teachers, colleagues and student learners. And yes(!) it does contribute to the credibility of ourselves as learners. #innovatorsmindsetch6 -I think we need to be more outspoken, visible and transparent in constantly sharing HOW MUCH the world and culture affecting learning is constantly changing ( exponentially) around us. It does not seem to be enough to mention it every once in a while, everybody returns to their classroom and schools to slip back into their tried and true old ways. We need more evidence of learning in #newforms , we need artifacts that capture the change. This concludes week 1 of the Instagram Book Study. Check back next week for post 2 to document the study and for my reflection on learning.